I fell in love with this dress as soon as I put it on! I want one other lucky bride to wear this beautiful wedding dress. DESCRIPTION: Simply stunning dress! This is where sparkle and glam meet the elegance of a rich, classic drape of ivory crepe. The illusion bodice detail is natural, beaded, porcelain tulle featuring a deep V back. The smooth, figure hugging skirt of Bellagio Crepe is double lined and extends into a long cathedral train. The final finish at the back is a simple, single row of self fabric covered buttons from waist-line to hem. From under the same buttons, the back zips up and a detachable Bellagio Crepe belt is included. SIZING: I am usually a size 6-8 . My measurements and the corresponding dress sizes were as follows: Bust: 31.5" Waist: 25" Hips: 32"
Therefore we ordered the size 9, I am a 10B and the built in cups had some extra room so the dress would fit a larger bust. Or the cups could be replaced with smaller ones. 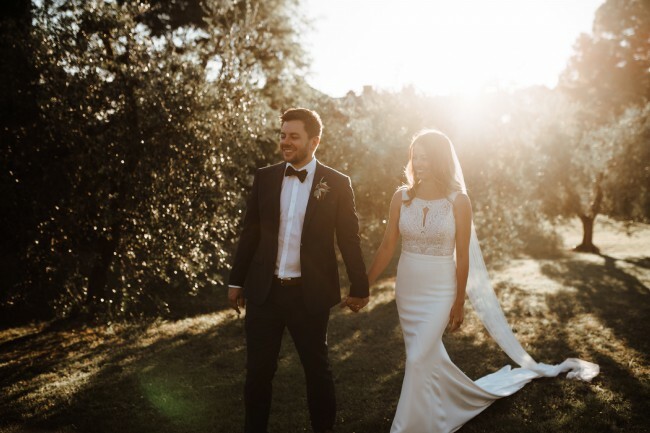 DRYCLEANED: The dress was worn once in mid 2017 and has been professionally hand cleaned with the utmost of care by reputable wedding dry-cleaning company in Subiaco, receipt it with the dress $400- There are still some marks underneath the bottom of the dress which can't be seen. ALTERATIONS: - The hemline was taken up very slightly by a professional dressmaker as well as around the hips. I am 163cm tall and I was wearing 4 inch heels. - A button and tie was added by professional dressmaker underneath the dress for the option to tuck up the train if desired during the night. It is hidden and unnoticeable. There are still some marks underneath the bottom of the dress which can't be seen and a little tear of the beading wear it attaches at the back near buttons. I have a picture to show if you are interested in the dress, I also have extra beading which came with the dress to fix this. Once you send a message, Aisha can invite you to purchase the dress.